Do you have a Server-to-Server postback call for survey completion? Yes, you can set a Server-to-Server postback call this through Pollfish developer dashboard. Can I pass a custom param in the Server-to-Server postback call for survey completion? Yes, please check available init function within the SDK. 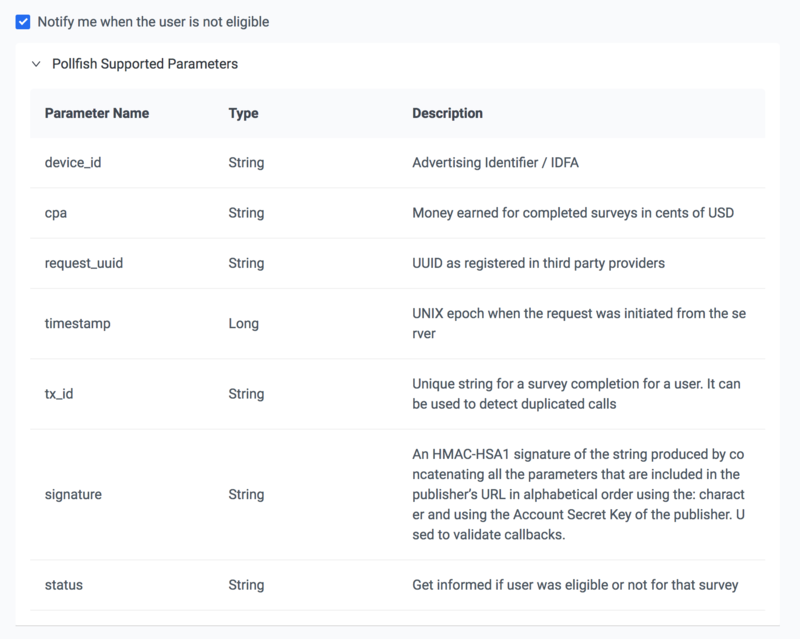 On Pollfish Dashboard you can set easily several different params for that call as you may see in the following image. Postback calls are not working as expected in developer mode. During developer mode each callback will have predefined both params: request_uuid and device_id as "debug". Your app should receive real values in these params only when in release mode. If you have properly set your postback url everything should work fine in release mode. Do postback calls fire on my own internal surveys too? Yes, please read the relevant documentation section here.